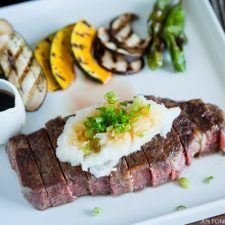 Learn how to achieve perfectly cooked medium rare Japanese-style sous vide steak (Wafu Steak), served with grated daikon, scallion and ponzu sauce. Next dinner party, your steak will be perfect. Whether you are cooking for two or for a large party, no sweat. Everyone will get a perfectly cooked steak on their plate. How is that possible? I’ll show you how I made my Sous Vide Steak – Japanese style, or as we call it Wafu Steak (和風ステーキ). 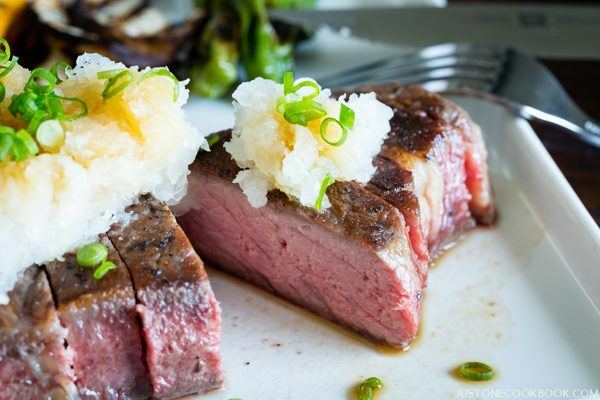 Perfectly cooked medium rare sous vide steak with a hint of garlic, served Japanese (wafu 和風) style with refreshing grated daikon, scallion and ponzu on top. Sous vide (/suːˈviːd/; French for “under vacuum”) cooking is a method of cooking in which vacuum-sealed food is placed in a temperature-controlled water bath. You set the temperature of the water exactly where you want it to be (typically much lower than normally used for cooking), around 131 to 140°F (55 to 60°C) for meat and higher for vegetables. Since the water is maintained at the temperature you want the food to reach, you don’t have to worry about overcooking or burning the food. 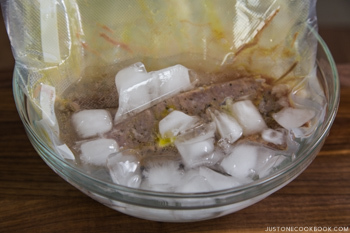 For example, if you are going to cook a medium-rare steak, you would submerge the bag of raw steak at 135°F/ 57°C and leave it in the temperature-controlled water bath until the steak reaches that temperature. Hence, the cooking time is longer than normal cooking times. 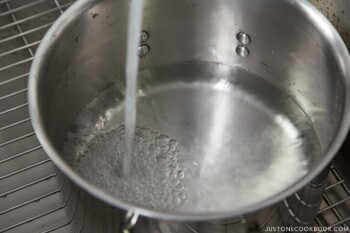 The idea of the water bath technique is to cook the food evenly, ensuring that the inside is properly cooked without overcooking the outside, and retains moisture. No Over-/UnderCooking: You can control over the texture of the food and eliminate any chance of over- or undercooking the food item because the bath temperature is the same as the target cooking temperature. Perfectly Moist: Since the food is sealed in vacuum bag, none of the moisture and flavors is lost through the cooking process vs. a grill or a stove top. The protein stays super juicy and flavorful, you no longer have to figure out exactly how long to cook. Evenly Cooked: It’s challenging to prepare irregularly shaped or thick food items on a stove. 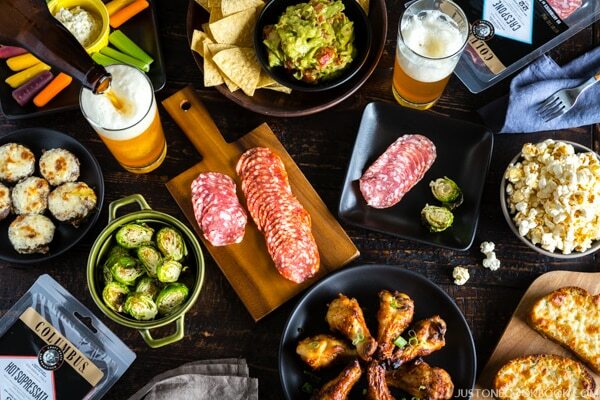 With sous vide cooking, it will come out perfectly as the optimal temperature will be reached throughout the food item. More Flavor & Aroma: Spices or other ingredients added to the food item in the bag transmit their flavor more intensely than during normal cooking. Do not over season the food. An Immersion Circulator: It’s the device that you insert into a pot of water or tub. The idea is fairly simple. It heats and circulates the water to a precise temperature in the pot. 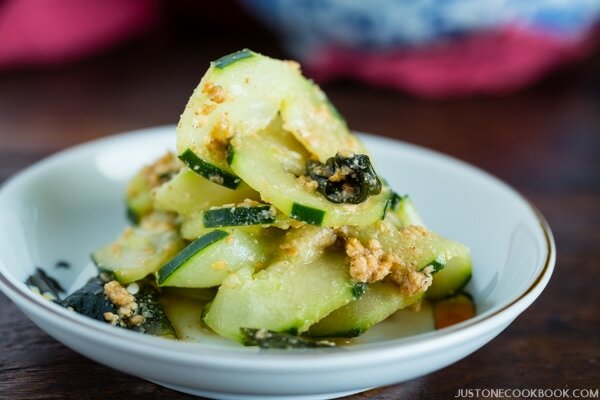 For this recipe, I used the Wifi Nomiku and I love this sleek device! At the beginning, I wasn’t sure if the Wifi functionality would be handy. However, as soon as I started using it, it made perfect sense. It’s was really easy to keep track of the cooking process on my phone even when I was out of the house. It also doesn’t take up too much space in your storage space compared to Sous Vide Supreme Water Oven. A Vacuum Sealer: Mr. JOC purchased a FoodSaver last year at Costco to store foods that we buy in bulk and to keep the leftover foods fresh for a longer time. Now we’ve been using our FoodSaver for sous vide cooking as well. Alternatively, many people use heavy-duty plastic zipper-lock bag (but air has to be pressed out of it) if they don’t have a vacuum sealer. It’s okay to use those bags as long as they are rated for higher-temperature cooking. Based on my own research on the internet, here are the guidelines for cooking steak. 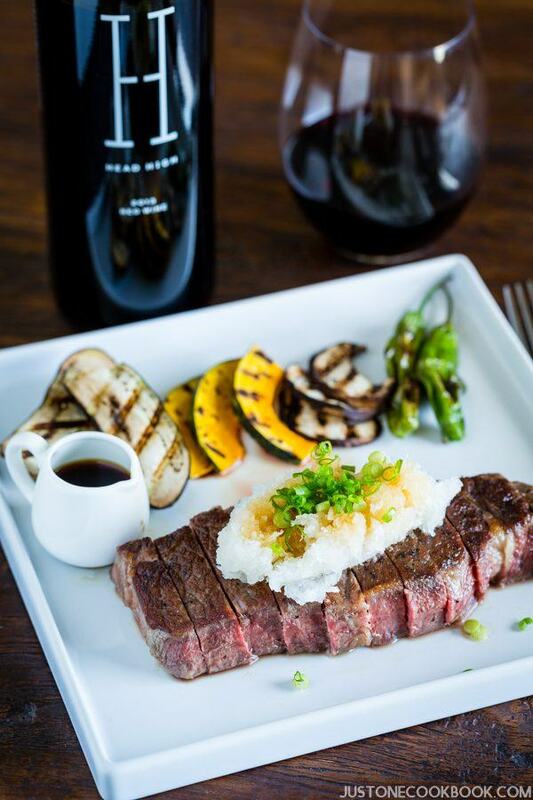 We paired the Wafu Steak with Head High 2013 Red Blend, and it was just perfect. The grapes for this wine is harvested a bit later, from late September through mid-October when they’ve completely ripened so there is very little acidity. The grapes are also sourced from a number of vineyards with five different varieties (Granache, ZInfandel, Cabernet, Merlot, and Malbec) so there is very complex flavor. As you smell the wine, it very sweet and aromatic without a trace of the acidity. With the very first sip, you taste very fruity overtones, smooth, lots of berries, and a bit syrupy. It’s one of those wine as you drink, it brings a smile to your face. This wine contrasts really well with the garlic infused steak. Since there is grated daikon and ponzu on top, the refreshing tastes pairs really well with this sweeter red wine. I also recommend this wine to drink for fun with friends and pair with crackers and light cheese. Fill your pot with water (with Nomiku, fill water past the line). Preheat water to your desired temperature. For medium rare steak, set to 135°F/ 57°C. Slice the garlic clove. Trim off the excess fat around the steak. Season both sides of the steak with kosher salt and freshly ground black pepper. Seal the bottom end of the food saver pack. Place the steak in the bag and add the garlic slices and 1 Tbsp. olive oil. Then seal the top of the bag. Make sure you pick “moisture” option as we have olive oil inside. Place the bag into the preheated water. A one-inch-thick steak will be ready to eat in 1 hour, the general rule is 1 inch per hour of cooking. The best part about sous vide is that it’ll never overcook, so it can be in the water for much longer (as long as water stays at the same temperature). 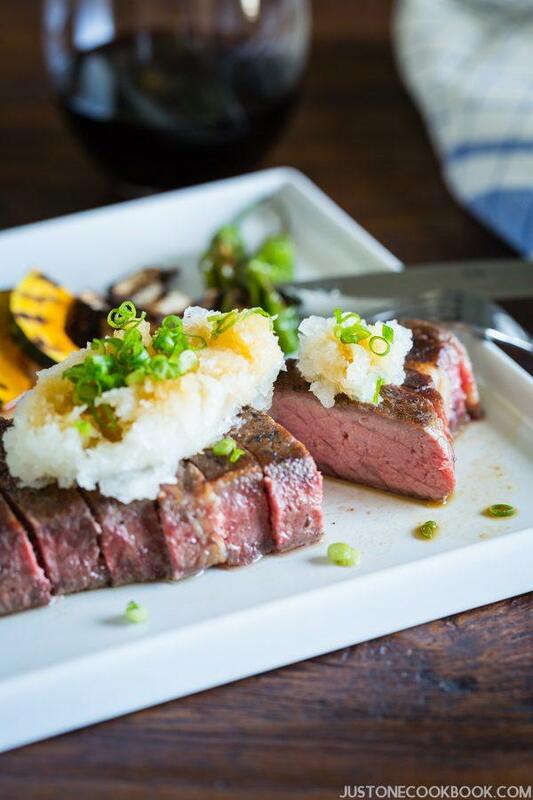 When the steak is almost done with sous vide cooking, slice the green onion thinly and grate the daikon. Set aside. When 1 hour has passed, pick up the bag and cut open the vacuum package. If you have more than 1 bag in the pot and plan on searing the meat separately, you can leave the rest of bags inside the pot. 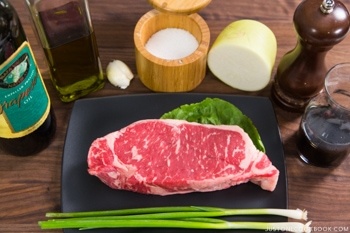 Remove the excess moisture on the steak with paper towel. It’s important to do this step so that steak will have nice sear. The excess moisture will “steam” the steak in the pan. To get nice sear marks on the steak, remove the garlic slices. Don’t worry, the steak already has nice flavor and aroma from the garlic while cooking in sous vide. If you like, you can cook the garlic on the side of the pan. Keep in mind when you cook sous vide, do not over season the meat. It cooks for hours with the seasoning inside and the seasoning is completely absorbed. 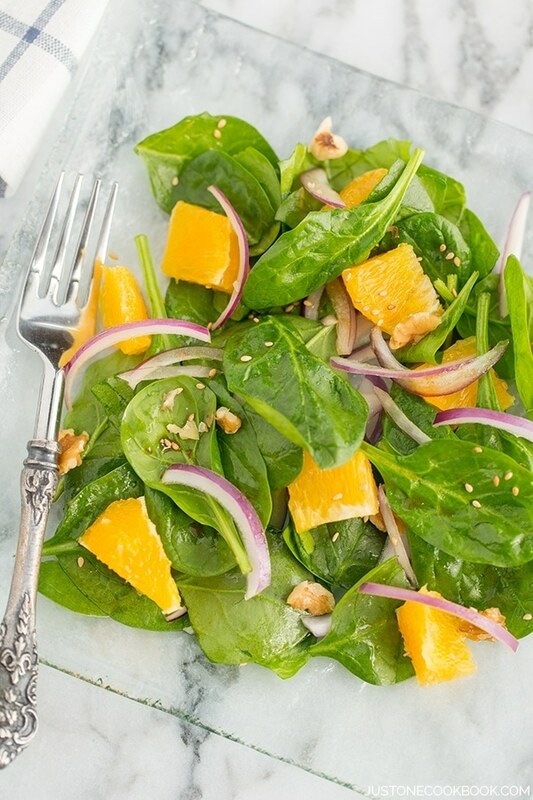 Preheat the cast iron skillet (or any frying pan) over high heat and add the grapeseed oil. When you see the smoke coming off from the side of the pan, add the steak. Sear each side of the steak for about 1 minute until it develops a golden-grown crust. Press down the steak once in a while to get nice sear mark, but don’t move it around. Flip and repeat on other side. You can also finish the steak on the grill. Transfer to a plate (no need to rest with sous vide!). 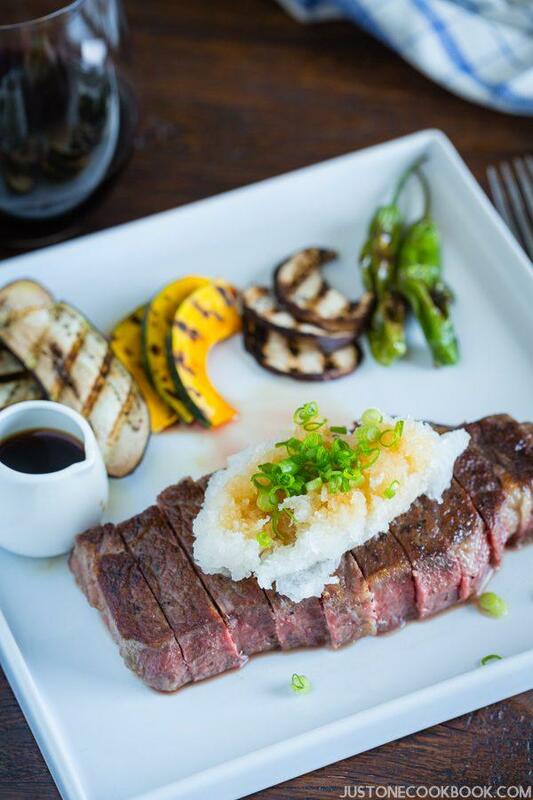 If you serve the steak in traditional Japanese way (with chopsticks), transfer to a cutting board and cut into ½ inch slices. 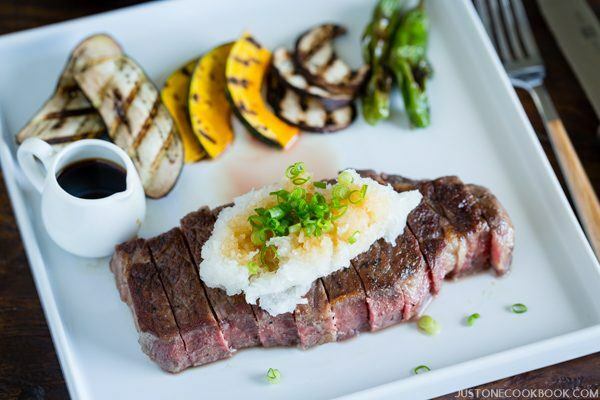 Gently squeeze grated daikon (liquid should not drip down) and place generous amount on top of the steak. Sprinkle green onion and pour the ponzu on top. 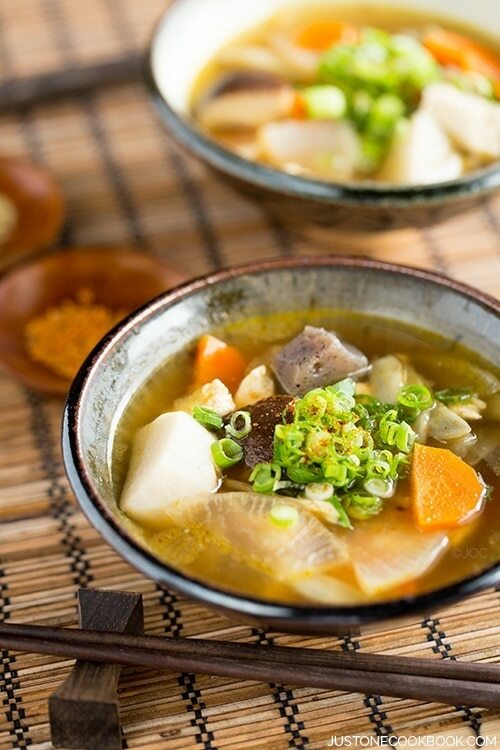 Serve with extra ponzu on the side. 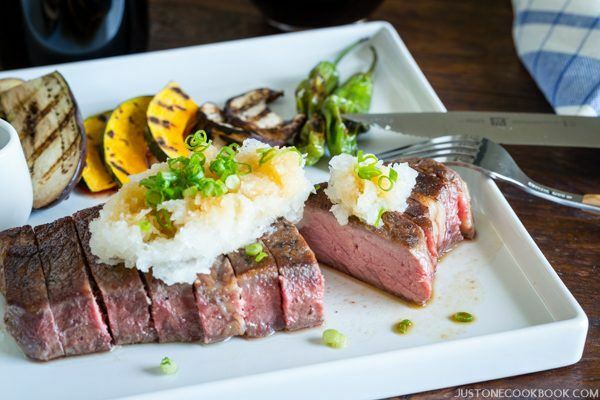 If you are not planning to eat the steak immediately after sous vide cooking. Soak in iced water (½ ice and ½ water) for 30 minutes to chill, and then transfer to the refrigerator to store and enjoy later. We received Wifi Nomiku free of charge to use in exchange for a sous vide recipe development. We received no compensation for the post. We received 2013 Head High Red Wine from Jarvis Communications free of charge to use in exchange for an honest review. We received no compensation for the wine review. I’ve been wanting to try sous vide for awhile now, but still haven’t purchased one. The meat looks delicious (although I prefer my meat more rare). Thanks for your recipe! Thank you Helena! Sorry I haven’t had a chance to respond to your email – will write back soon! Hi Nami, I’m curious about the noise that you said you get when recording in the kitchen. I’m not the greatest expert but I’m learning a lot with regards to music (and audio recording is one of the important cornerstones to that). I wonder what the difference is between your setup in the kitchen compared to the other room. There probably is something sending an electric signal through the cable of the mic when in the kitchen but the source sending this noise can be so varying (like electronic devices, flashlamps, or even more distant sources). A current can be also send through the gear holding your mic. (I’m just blasting ideas out on what it could be). Hi Leo! Thank you so much for helping me! The kitchen is more spacious and open area and maybe the sound is recorded differently there. Both times the microphone was clipped on my shirt to record. You’re more high tech than me! I think the I should’ve asked, “is the noise persistent or arising when someone or something is causing a sound?” From what you said it sounds more like it arises at particular moments. Additional sound might also be the issue (although I can’t say for definite). The kitchen tends to be one of the rooms with the most acoustic echo (the other room being the bathroom) mainly because there is little sound-absorbing material. If these echos recombine where the mic is situated then the amplified sound going in may “clip” the sound. Clipping is basically a sound arising from the audio system as it can only take a certain amount of sound in, it will saturate at too loud signals and cause irritating electronic noises that occur around when talking. Getting a right level balance is also needed. Too little will not record a good signal-to-noise ratio (the true audio signal recorded over the noise, where the noise can arise from the electronics or additional ambience). Too much sound again leads to distortions. You can tweak the internal input level – I would try first the input level of the system that is connected to the mic as its the most easiest one to adjust. Radio signals from can also be a problem. Usually they could be heard in the recording as something persistent but the noise usually fluctuates (between louder and quieter) depending on what causes the radio signal or what the recorded signal is doing at that point. The easiest trick on that part is to set all electronic equipment that receive Wi-Fi, mobile data, etc. to airplane mode. If its your breathing? If there was something different in the setup (like the input gain/level) then potentially. If the noise is coming and going, and by chance it coincides with your breathing then very likely. To check that is to do a short recording of audio and a video looking at you while you something in the kitchen (should be something like 1-2 minutes only – no major task to save your time). Might also be good to do the same in the other room for a reference. Anyway I hope this gives some thought. Sorry that I responded slightly later than I intended. I’m currently packing to move to a new rented property with my brother. We spent the weekend just filling boxes and taking furniture down. Very tiring job to do! Hi Leo! Thank you so much for all the info! I’d love to offer packing job to return my favor as I actually enjoy packing/unpacking part of moving. I know, I’m a bit crazy. We “think” we figured it out. The internal microphone setting was “auto” and we changed to low. We came back to the office and listened to the sound and we think it’s good. We tested different setting to make sure what is right. Hopefully next recording will go smoothly, and I might as well change the clothes 10 times again to do that last failed recording for those 10 recipes! Yikes. I forwarded your comment to Mr. JOC too. We appreciate your helpful input! Great looking steak! I haven’t played with sous vide yet, but really am thinking about it. It’s great for perfectly cooked meat, a real advantage. Really fun and informative post — thanks. Is it ok to put shio koji inside the plastic bag with the steak while sous viding? Nice recipe! It came out nicely. I did, however adopt a slightly different approach. I did not have a water bath sous-vide machine. What I have is a Breville counter-top oven which does have an adjustable thermostat. Using that & setting it to 140F I was able to accomplish the task. I also used a zippy-lock plastic bag, instead of the vacuu-seal machine (which is buried in the cupboard somewhere. The trick here is to get most of the air out, close 3/4 of the top & then submerge the bag with the steak in it in a pot of water with just the corner poking up above the water. The water pressure will force the remaining air out of the bag & then you just close the bag. The vessel I used was a 9×9 baking tin which holds enough water to cover the baggie. Once the oven has stabilized in temperature, I poured 150″ (hot water) into the pan with the steak & place the pan into the oven. Don’t worry, the water cools off immediately with the cool pan & steak. Or, you can use cooler water, the cooking time will just be a little longer. Final temp 136F – medium rare. I also monitored the oven with a hand-held infrared temp sensor (cheap), but a candy thermometer should work as well. Great idea. I don’t have a counter-top oven but I guess a normal oven would work too if you could keep temperature reasonably constant? I’m very keen to try sous vide but at $199 for the wifi nomuki, I don’t think I’ll be trying it anytime soon. That’s why I love the countertop oven method! Very impressive. This methodology to cook food in water is becoming more and more popular here in Peru. And as you show in this post, your meat is cooked in the perfect way. I never try to do this at homr, but I have a fried who opened a business and sold pre-cooked food in the sealed bags, of course cooked in water. 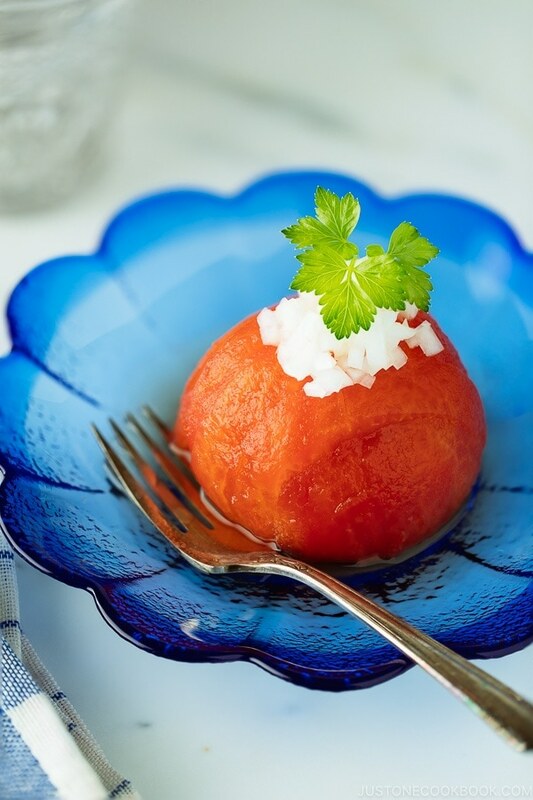 Wonderful recipes, and really stunning pictures. I’ve been meaning to get food saver. I think it’s so worth it, especially for busier households when we tend to buy in bulk. Nami, that is such a top notch video!! and your kitchen is just soooo beautiful!! Just watched the video. Very professional Nami. I love that you have very soft and soothing background music as opposed to loud headache-inducing “modern” style music. I say modern for lack of the correct name for the genre that I’m referring to. Looks great.. I have a question..
How do you warm up the steak? Do you have to sous vide it again? or just sear it? 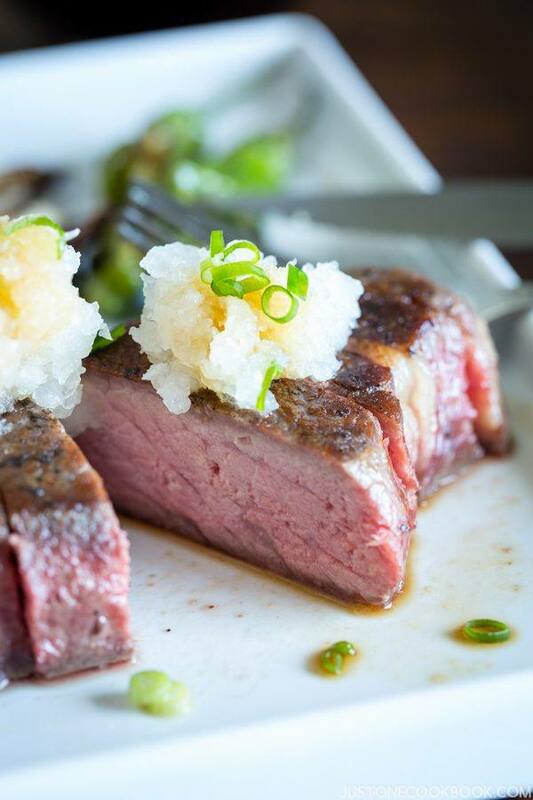 What would happen if a wagyu steak meets sous vide? Hi Lu! We think the fat in the meat melts, especially the REAL wagyu from Japan (Not American “wagyu”). 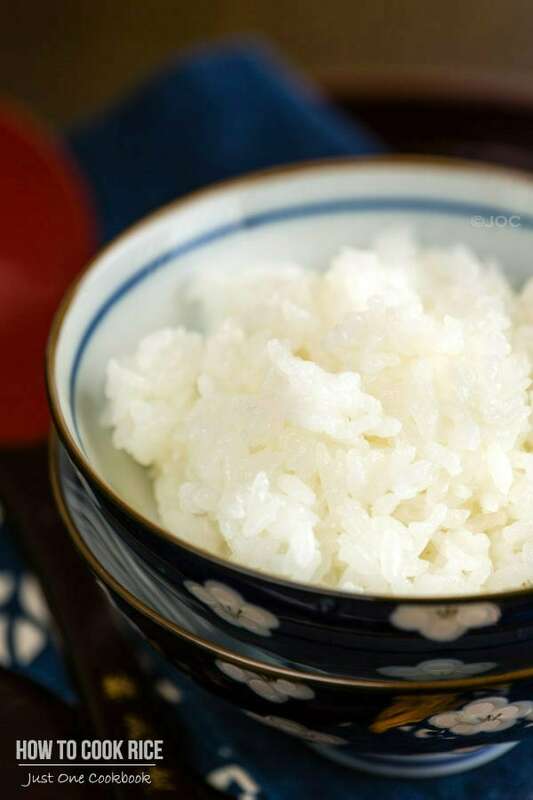 The fat content is really high… We are afraid of wasting our real wagyu. Maybe American wagyu is okay? You mentioned that I can keep the steak for consumption later by placing it in an ice bath and then refrigerator. However, how would you suggest I heat up the steak so that it wouldn’t be overcooked?